Of course ice cream can be vegan (while being super simple and cheap)! A lot of the vegan ice creams I have seen in stores have been quite expensive, usually using tofu or coconut as the “cream”. I have found a very simple recipe from following Vegucated on Facebook, and lately they have been posting a lot of recipes for vegan ice cream, including this site. I plan on trying some of these recipes out, as I have heard coconut ice cream is fantastic. But, for now, here is a recipe for Banana Chocolate Chip Ice Cream. A few hours before I wanted to eat the ice cream, I pealed the bananas and put them in the freezer. Once the bananas were frozen, I placed all the ingredients in a food processor and blended until really smooth. 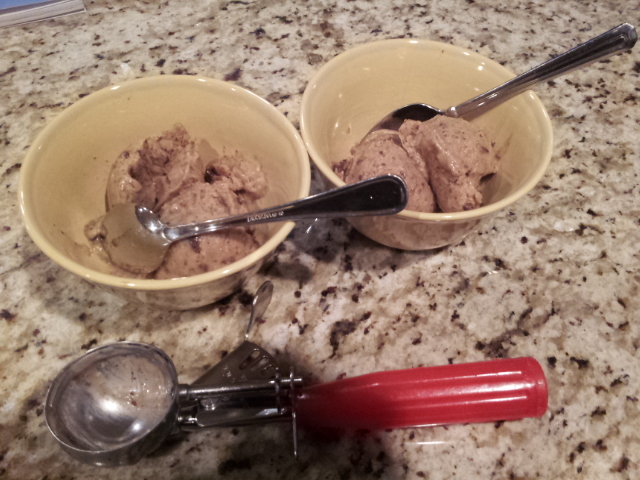 I scooped the ice cream into a container and froze it for about an hour, until the ice cream was scoopable. TaDa! A few weeks ago I made vegan cookies that went really well with this ice cream, but were also great on their own. 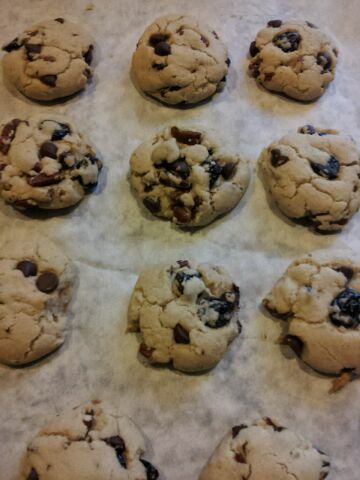 Here is a recipe for Chocolate Cherry Pecan Cookies, from Let Them Eat Vegan by Dreena Burton. I combined all the dry ingredients in a bowl, then stirred in the chocolate chips and pecans. In a separate bowl I mixed together the maple syrup, extracts, oil, and cherries, then added the wet ingredients to the dry ingredients until just incorporated. Then, I scooped the dough on a parchment-lined baking sheet, making about 12 cookies, and flattened each cookie slightly. The cookies were baked for 11 minutes at 350 degrees Fahrenheit. So here is a cookies and ice cream combo that is delicious, nutritious, and simple. While the cookies are definitely less “healthy” than the ice cream, they sure add a yummy crunch to this cream-less ice cream.